President Sally Kader was invited to speak at the formal opening ceremony for the exhibition "We Are What We Eat" held at 6pm on Friday, 6 May, in the Visitor's Lobby at the United Nations Headquarters in New York. The exhibit was organized by the Jack Brewer Foundation, and endorsed by the Permanent Mission of Malawi to the United Nations. Speakers included H.E. Ambassador Lot Dzonzi Deputy PErmanent Representative of the Permanent Mission of Malawi to the UN, Jack Brewer, Aaron Levi Garvey, and RiceBran Technologies CEO W. John Short. 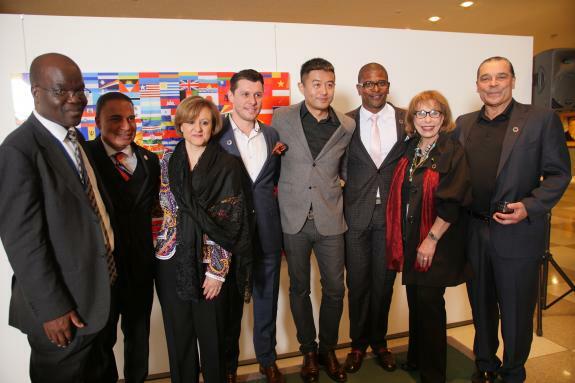 Attendees included JBF Global Ambassadors, Klein Sun Gallery, featured artists including Liu Bolin, celebrity athletes and entertainers, UN ambassadors, international diplomats, and others. Through a variety of colorful mixed media artworks and thanks to data and infographics by the Food and Agriculture Organization (FAO), the exhibition focused on the human right to food, especially that which is healthy and sustainably produced. The artwork on display underscored the pressing need for sustainable agriculture that is both respectful of animal rights and the environment, and highlight issues related to mass production, ultra-processed foods and global fast-food chains.